Dynamic, active, constantly changing, the flowing and moving part of life - that's Yang energy. The passive, silent, deep, allowing, deeper, mystical and observing part of life - that's Yin energy. The harmony lies in the balance of these two energies. Yin Yoga practice has transformative effects on body and mind. The gentle but consistent stimulation of the connective tissue encourages long-term health and flexibility of the joints, recharges the energetic system of the body and naturally draws the mind inward into a relaxed, meditative state. It also prepares the body and mind for longer meditation practices. Yin yoga integrates the yogic practices from India, with Chinese meridian theory and Buddhist mindfulness practices into a wholesome way to bring health, vitality and wakefulness into your daily life. The Yang yoga is the active yoga, exercising the more superficial tissues of the body, so this part of the practice includes sun salutations and movement between poses focusing on breath, plus bringing in the mindful attitude gained from the Yin practice. ​Yin yoga - a closer look! There are two principles that differentiate yin practice from more yang approaches to yoga: holding poses for longer (at least several minutes) and stretching the connective tissue around a joint. To do the latter, the overlying muscles must be relaxed. 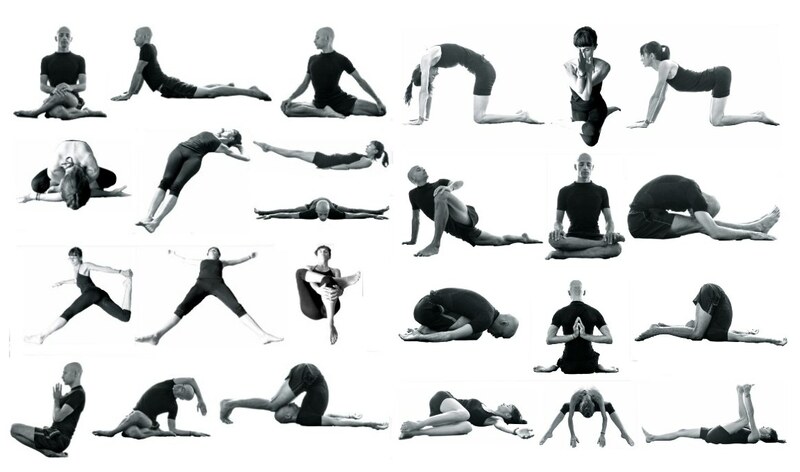 As one ages flexibility in the joints decreases and Yin yoga is a wonderful way to maintain that flexibility. One of Yin yoga's central aspects is surrender - a letting go on many different levels. Relaxing the muscles while holding the poses for several minutes is letting go on the level of body. Passively sinking into the poses and in stead of contracting and holding on when it gets challenging, we retrain ourselves to soften, relax and let go. Another important aspect of Yin is to stay and really listen, to connect rather than disconnect, to allow rather than push away. In a way the yin practice requires us to be ready to get intimate with the self, with feelings, sensations and emotions that surface during the longer passive holds in poses. It is about staying with what IS, rather than trying to analyze it, fix it, change it, enhance it - something that we are not always used to in our "get things DONE" world. Yin practice is about BEING, rather than doing. This is where the mindfulness techniques join the practice - to pause and separate the inner dialogue from what is really happening, to observe and discover about the holding patterns in our mind, body and breath. Yet another dimension of this powerful practice can be termed energetic fitness - our ability to move, feel, relax and store energy (chi, prana, qi) in our bodies. Chinese medical practitioners and yogis have insisted that blocks to the flow of vital energy throughout our body eventually manifest in physical problems. The energy lines (called meridians in Chinese medicine, nadis in the yoga tradition) are stretched and stimulated during the longer holds in the yin poses (kind of like having an acupuncture session). The energy lines are connected to different organs, therefore the strength and flow of the meridian system is essential for the harmonious balance in our body and mind. The Yin yoga practice is ideal for everyone, both experienced yogis and complete beginners. Yin yoga complements perfectly other more dynamic yoga styles (like Vinyasa flow) or training programs, and most importantly it balances a stressful, action oriented and goal driven lifestyle. No prerequisites or previous experience is needed. hold for time - this is where the practice begins: after coming to your edge and becoming still, you stay. The yin tissues of the body (connective tissue, tendons ligaments) respond to long-held even pressure. My fascination with Yin yoga began around 2009, with a desire to slow down even more. I must confess, Yin yoga for me was not love at first sight, but it gets under your skin and once I felt the benefits - the greater openness in the body, higher energy levels and clearer mind, it kept me returning to this practice on a daily bases. I started teaching Yin yoga in 2013, I've done 200 hours of Yin Yoga Teacher Training with modules focusing on Yin Yoga Anatomy and Meridian Series. Yin and anatomy - focusing on the physical benefits and applications of the body. It is a practice that increases flexibility, opens hips and spine, helps with back problems etc. Yin and energy - our overall health is determined by the quality and mobility of Qi (enegry, lifeforce, prana) circulating in out body. A yin practice can be considered both preventative and restorative, enhancing the quality and fluidity of the energy flow in the body. Yin and mindfulness - a yin practice is a perfect ground for mindfulness training, staying attentive and aware, observing the passing and ever-changing sensations in the body and the reactions in the mind. I help to organize Yin Yoga Teacher Trainings for my teachers Sebastastian Pucelle and Murielle Burellier. Look for a Yin yoga class in my video library.